To build an igloo you really only need two things: a shovel, and a bunch of snow. Add candles, cocktails, and friends to create a classic igloo party, and a magical way to spend a Maine winter evening. Here’s how we built ours! Early last weekend Mother Nature delivered the goods. It was an epic snow event that challenged the common notion that snow falls from the sky; in this case the snow came at us from all angles, including upward, as if from an angry hairdryer located far beneath the earth’s crust. This melee resulted in more than 30″ of fresh pow, spread like a child frosts a cake, unevenly across our yard. While most of the fluffy white ended up on our car, a decent amount blanketed the back yard, and so Justin proposed an igloo. It had been almost a decade since I’d witnessed an igloo being built, so I put together the following video that distills this 3-hour project into a palatable 45 seconds. Meanwhile, as I triangulated our Subaru and began digging, I daydreamed about the perfect igloo cocktail. A snow event of this magnitude is rare, even in Maine, and I felt it called for something more creative than passing a whiskey bottle. I mentally mulled over hot beverage concoctions but hadn’t settled on anything when we walked to Sam DiPietro’s Market later that afternoon for libations and a few groceries. It may go without saying, but the only thing that scares me about a snowstorm is the Hannaford Supermarket in the days leading up to it. Therefore, we were running a little low on provisions. Not such a risky proposition considering our proximity to DiPietro’s, their commitment to 365 days-a-year service, and the excellence of their homemade meatball sub. No one was going to starve around here. So while I casually picked out olives and a couple of cans of San Marzano tomatoes, Justin perused their ample liquor aisle. When I found him he was gazing at a bottle of Campari. 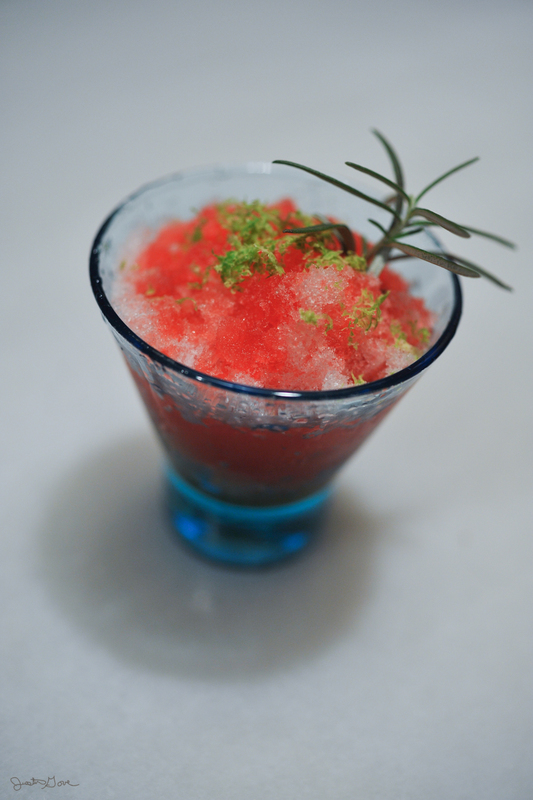 An idea hatched: Campari snowcones. It brought me back to a memorable lemon ice, la grattata, I bought from a street vendor in Naples, both ingredients cut fresh for customers on the spot. Where la grattata limone was tart and refreshing, perfect for the sultry Napoli climate, ours would be a sweet and woody affair, more aligned for a winter evening in an igloo. I decided to match the pine tree and orange rind flavor of the Campari with a quick, homemade rosemary simple syrup (1:1 raw or cane sugar to water, bring to boil, remove from heat, add rosemary and remove after 30 minutes), and a little lime zest. Of course there was the final ingredient: the snow. According to Wikipedia, “The first documented ‘shaved ice’ dessert was made in 27 B.C.E. The Roman Emperor Nero sent slaves to collect snow from nearby mountains that he then flavored with a fruit and honey mixture.” We would revive Nero’s ancient dessert using the bounty from a blizzard called Nemo, and we would venture to the backyard to fetch it ourselves. Our Campari Snowcones turned out even better than expected. A kind of Maine woods and Fellini film mash-up, the bitter Campari balanced nicely the sweet syrup, both adding strong, arboraceous flavors to the mix. I started with the syrup on the bottom, adding the Campari to the top of the snowball to preserve its shocking red color. We used spoons to muddle and slurp the snowcones down, the fluffy snow turning into a delicious and rewarding slush. Justin hollowed out spaces in the igloo to house small votive candles, which emitted a warm glow inside our little hovel. We enjoyed a Campari Snowcone in the romantic atmosphere, and were later joined by our dear friends and neighbors, who arrived wearing their snowpants. Together we warmed the igloo with stories, laughter, and – okay, I’ll admit it – a passed bottle of whiskey, cozily insulated from the wind that sill howled on the other side of our snowy walls.